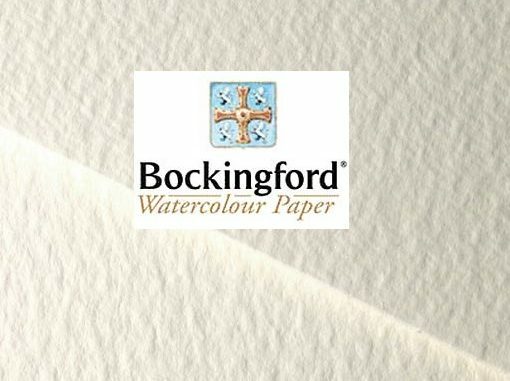 Bockingford is one of the worlds most popular watercolour papers - not surprising considering it offers superb quality at a great price. Bockingford is available in a range of weights and surfaces with the most popular weight generally being 300gsm (140lb) NOT surface. I however given the choice personally opt for the 425gsm (200lb) EXTRA ROUGH as it then completely eliminates any need for you to stretch your watercolour paper which is a tiresome task that should be avoided at all costs. The rough textured surface of this paper also gives you the perfect surface to produce texture ridden landscapes on. Note: One little aside I would add here is that Extra Rough is the Bockingford equivalent of the Rough surface you get with other brands. Why the mill decided to call it Extra Rough I have no idea because it is not really any rougher in surface than a standard Rough surface paper. Bockingford is classed as a student paper by a lot of professional artists but to be quite frank about it - they are talking out their posteriors and you can quote me on that if you like! Bockingford in my opinion is one of the best papers on the market and has provided me with a consistent high quality surface to work on for over 20 years. It’s good stuff! Why?…Well not only does it share many of the important qualities of a top quality rag sheet but it also has a hard sizing which basically means that the colour stays on the surface a bit more than it would with a cotton paper where it will soak into the fibres of the paper more. This however means that if you need to correct anything you can. It also means if you adopt scratching out techniques in your painting like I frequently do then techniques not only work better but you are also less likely to damage the paper. And…….Bockingford watercolour paper is one of the cheapest high quality watercolour papers on the market. So what’s not to like?……That’s right nothing - go buy some lol!